In this tutorial you are going to learn how to create a Skype call link. Open a web browser and navigate to “https://dev.skype.com/skype-uri/generator”. Scroll about a quarter of the way down the page, select and copy the html code you see in the gray box, under the heading “Use Skype URIs to create simple buttons”. 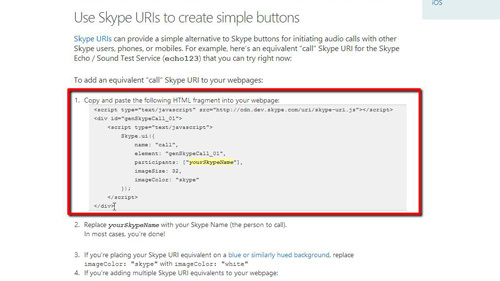 This code will generate a Skype “Call” button in a web page. You can find the html code you need to place a “Call” button in your email signature a bit further down that same web page, in the next gray code block. 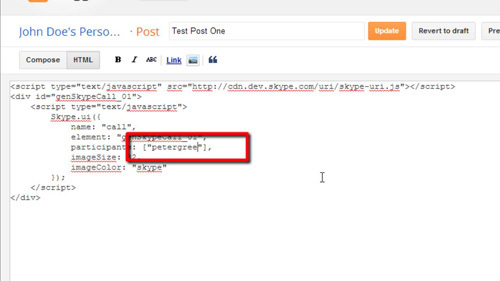 After copying the code in the previous instruction, paste that fragment into your webpage or email where you want the Skype call link to appear. In this example we are going to be placing the call button into a Blogger page. In the code replace “yourSkypeName” with the Skype name of the person to call when the button is clicked. Let’s make sure that the button works by clicking “Update” then on the “View blog” button at the top of the page. As you can see a “Call” button has appeared in a blog post, click on this. Your internet browser may ask permission to launch the Skype application, allow this to happen. Your Skype application will inform you that you are about to place a call. 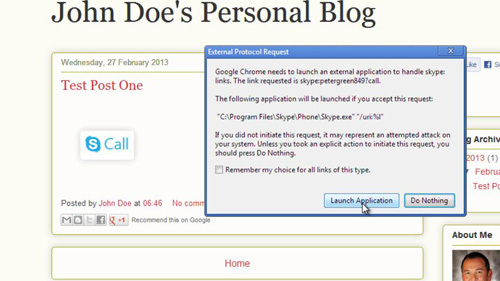 All you need to do is click “OK” and that is how to create a Skype call link.